Home / Uncategories / Canada : Ford recalls 342,000 Windstar minivans made in Oakville, Ont. Canada : Ford recalls 342,000 Windstar minivans made in Oakville, Ont. 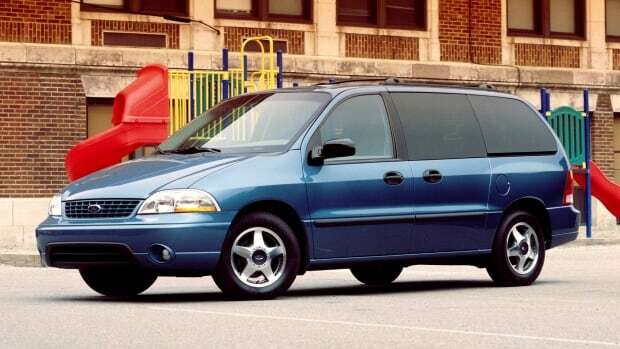 Ford recalls 342,000 Windstar minivans made in Oakville, Ont. 2nd safety recall for rear axles that crack as vehicles age. Ford Motor Co. has issued a new North American recall involving 342,271 Windstar minivans built in Oakville, Ont., because of a rear axle that cracks. The recall, which affects about 58,853 Canadian vehicles, is the second for the same safety defect that affects 1998 through 2003 models. "There is a risk that the combined effects of corrosion and stress can lead to cracks in the axle that – if undetected – can grow and result in a complete fracture," Ford said in a news release on Wednesday. The company said a "small number of accidents" have been connected to the Windstar minivans, but no injuries. In 2010, a bracket designed to mitigate problems was installed, but Ford says it now believes some of the brackets may have been installed incorrectly. Customers whose vehicles had the bracket installed incorrectly will have their rear axle replaced. If the bracket was correctly installed, customers will receive an incentive to replace the rear axle at a reduced cost, Ford said. 2001-2008 Ford Escape and Mercury Mariner 2001-2008 vehicles with transmissions that might have loose shift control lever bolts. 2015 Ford F-150 trucks with an adaptive cruise control problem that automatically brakes the pickup. 2015 Ford Taurus and Lincoln MKS sedans and some 2016 Ford Explorers with fuel tank attachment bolts that might not have been tightened properly. 2016 Ford F-53 and F-59 stripped chassis vehicles with possible shift control bracket issues. 2016 Ford Fusion and Lincoln MKZ 2016 vehicles with fuel tanks that could have been improperly manufactured and could crack in a crash.